Jon Singleton. Scott Kingery. Eloy Jiménez. MLB.com's No. 3 overall prospect joined rare company by signing a long-term contract before making his Major League debut. The White Sox made it official on Friday, inking their top prospect to a six-year, $43 million deal with two club options that could run through 2026 and grow to $78 million. According to MLB.com's Scott Merkin, Jiménez gets a $5 million bonus this year in addition to his $1 million salary. The latter figure increases to $1.5 million next year, $3.5 million in 2021, $6.5 million in 2022, $9.5 million in 2023 and $13 million in 2014. The White Sox have options that would pay $16.5 million in 2025 and $18.5 million in 2026. 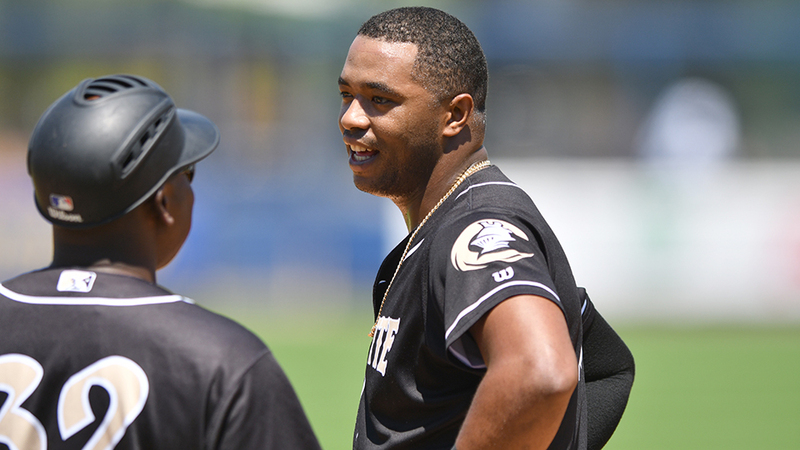 "Eloy is a tremendously talented young player who has impressed us with his baseball skills, poise and maturity from the moment he joined the White Sox organization," White Sox senior vice president/general manager Rick Hahn said in a statement. "We view him as an important member of the core we are building over the coming years and so are pleased to have reached this long-term agreement to have him in a White Sox uniform for many seasons to come." Jiménez was optioned to Triple-A Charlotte last week, as a two-week delay in the 22-year-old's big league debut would have resulted in the team getting an extra year of control. With the new deal, service time is no longer a factor. The two club options will cover what would have been his first two years after free agency. "My family and I are very happy and excited to sign this deal," Jiménez said. "It gives us the opportunity to ensure our future, but more importantly, to reinforce my commitment to the White Sox organization. All of my effort, focus and desire is to help this team win multiples championships and bring joy to our fan base." The Cubs signed Jiménez in August 2013, and he began his career the following June. The outfielder broke out in 2016, hitting .329/.369/.532 with 57 extra-base hits and 81 RBIs for Class A South Bend. At the 2017 trade deadline, Jiménez was sent to the White Sox for Major League southpaw Jose Quintana in a five-player deal. Since joining the White Sox, Jiménez's stock has only continued to rise. Highlighted by well-above average power and hit tools, the outfielder gets an overall 70 grade on a 20-80 scale. Last season, Jiménez hit .337/.384/.577 with a career-high 22 homers, plus 75 RBIs as he advanced from Double-A Birmingham to Charlotte. Jiménez had a tough stint at big league camp this spring, going 4-for-26 (.154) with three extra-base hits, three RBIs and nine strikeouts in nine games. So there is a chance the White Sox will start the Dominican Republic native in the Minors based on his spring results. Singleton was the first player to sign a contract extension before his Major League debut, inking a $10 million, five-year deal with the Astros in June 2014. After starting that season in the Minors, the first baseman hit .168/.285/.335 in 95 games with Houston. Singleton was released by the Astros last May, though he still got paid for the season as part of the 2014 extension. More recently, the Phillies and Kingery agreed to a six-year, $24 million contract a year ago. The shortstop made the Opening Day roster and spent the entire campaign the Majors, hitting .226/.267/.338. In 2013, George Springer turned down a similar deal, reportedly for seven years and $23 million before his Major League debut the following April. The eventual World Series MVP and the Astros avoided arbitration by signing a two-year, $24 million deal in February 2018. As teams focus on retaining homegrown talent, Rays No. 9 prospect Brandon Lowe inked a six-year, $24 million extension on Tuesday. The utilityman hit .297/.391/.450 with 22 homers in the Minors last year en route to his Major League debut in August. With Tampa Bay, Lowe notched a .774 OPS in 43 games.